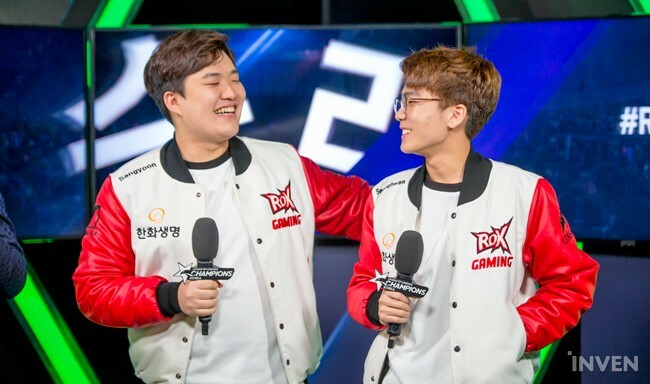 ROX SeongHwan: "Coach gave us each assignments and we all completed them well." With the power of the players who came back from EU, bbq played well in their first match. However, in today’s match, they weren’t able to collect the victory. The ROX Tigers and bbq Olivers were neck and neck up to game 2, but ROX Tigers dominated game 3 to secure the victory. After the match, Yoon "SeongHwan" Seong-hwan and Gwon "Sangyoon" Sang-yun were interviewed as today’s MVP. Below is the interview with the two players. Related: ROX Lindarang: "Sivir is good, but we aim for rolling the snowball." Q. You lost at game 1, and made an unbelievable comeback in game 2 to win game 3 as well. How do you feel? Sangyoon: When a team member goes to another team, and if you play against that team, we feel that we really need to win. Coach Sin Hyeok went to bbq, and the joy of victory is triple. We prepared different picks because he knows us well. Q. So what did you prepare? Sangyoon: Orn wasn’t very important, but Vladimir and Galio were the main characters. Q. How was it playing against bbq’s Zak? SeongHwan: His play wasn’t very aggressive, so I played comfortably. Q. Now with your first win, do you see yourself going to Worlds? Sangyoon: Game 3 was really good, but game 1 wasn’t good. If we practice really hard, we might be able to go. SeongHwan: I’m happy that we won. More than anything else, I’m thankful to Lava, because he was sick since yesterday. He even went to the emergency room. I’m really thankful to him because he was able to play today.(Q. Is he better now?) He says that he’s alright, but he doesn’t look alright. Q. Fans say that the last match was one of SeongHwan’s best games ever and that the synergy with Lindarang was awesome. What did you feel in the last match and today’s match? SeongHwan: Recently, I found enlightenment in the jungle. If I just cling to this feeling, I think I can be a lot better than before. Q. Was there anything different during the last few days? SeongHwan: Recently, our scrim results weren’t very good; we even lost to challenger teams. But our coach gave us each assignments, and I think everyone completed the assignments well. Q. Many fans predicted ROX Tigers as the underdogs. Do you have anything to say to them? Sangyoon: I also would have thought that we were the underdogs. We’ll do our best to not hear that. SeongHwan: I’ll do my best so we can get to Worlds. Thank you.